Late and tired tonight as well. Just a very short, and very unserious session tonight. Been thinking about using Adobe Kuler (seems to have been rebranded to Adobe Color CC) to get a better palette of colors to use when working with programmer art as I currently do. The result wasn’t very impressive so I guess it needs a little bit more tweaking. 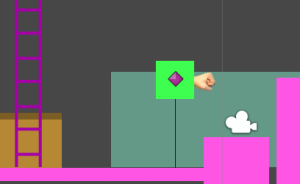 I also added a punching fist a la Alex Kidd, but the player doesn’t have anything to hit yet. And the ladders are still broken (will fix that in my next session).